An athlete needs constant training to gain improvements. But it is not only limited to the practice room or the gym. They also need to train in live competition to test whatever they were practicing in an actual game and be able to tweak their performance. Ever since I started competing in Memory Sports, I’ve always wanted to join as many tournaments as I can to test myself in an actual championship setting. But given the circumstances at the time, most of the memory championships available for mnemonists are at the other side of the world. We would have to jump through so many hoops just to compete in one international event. But not this year. Memory sports is sort of boomingthis year. I guess the sport is having a new wave of popularity as there are new memory championships popping up in different places. Here in the Philippines alone, there are two memory tournaments slated this year. 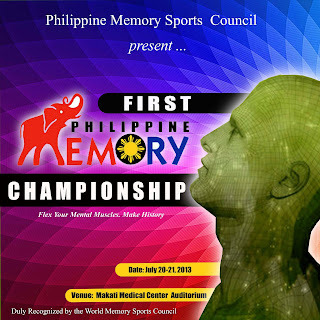 The first one was just a couple of months ago and tomorrow, we’ll be having another memory championship, the Philippine Memory Championships. It will be another opportunity for Filipino mnemonists to pit each other’s memory against one another. And according to Quinito Henson’sarticle, it looks like we’ll be having World Championship Standards cramped into two days. That’s two one hour events (Cards and Numbers) and a 30 minute Binary event. This could get interesting. Stay tune here as I’ll be updating this post about this weekend’s happenings, if I can get some internet access at the venue. I have mentioned before that there are quite a numberof memory championships this July and I somehow overlook the other events that have happened or will happen in this month. Such as the Algerian Championships lastJuly 4-5 that was won by Meryem Yezza and the 17th German OpenMemory Championships this coming July 26-27. We’ll be taking a close look at the German Open as it may be a preview of things to come at this year’s WorldMemory Championships.